Konya (Turkish pronunciation: [ˈkon.ja]; Greek: Ικόνιον Ikónion, Latin: Iconium) is a city in the Central Anatolia Region of Turkey. It is the seventh most populous city in Turkey. As of 2014, Konya has a population of 1,174,536. Konya is an economically and industrially developed city and the capital of Konya Province. 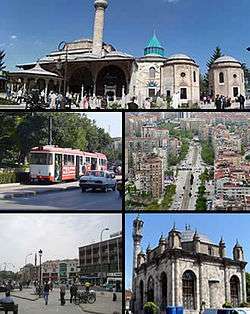 Konya was historically the capital of the Seljuq Sultanate of Rum and the Karamanids. Konya, was known in classical antiquity and during the medieval period as Ἰκόνιον (Ikónion) in Greek (with regular Medieval Greek apheresis Kónio(n)) and as Iconium in Latin. This name is commonly explained as a derivation from εἰκών (icon), as an ancient Greek legend ascribed its name to the "eikon" (image), or the "gorgon's (Medusa's) head", with which Perseus vanquished the native population before founding the city. In some historic English texts, the city's name appears as Konia or Koniah. Excavations have shown that the region was inhabited during the Late Copper Age, around 3000 BC. The city came under the influence of the Hittites around 1500 BC. These were overtaken by the Sea Peoples around 1200 BC.